Justine's Cardmaking: So Suzy Stamps New Release + 3rd Birthday + Giveaway! So Suzy Stamps New Release + 3rd Birthday + Giveaway! sorry I have been MIA for the last two days. I just needed to recharge and I will have fabulous videos throughout the rest of April to celebrate my 1 million views! Today I am celebrating So Suzy Stamps' 3rd Birthday AND their new release is out today as well! It is super exciting chocked full of beautiful flowers and elegant birds - not to mention a great sentiment as well! Plus I managed to convince them to offer the ENTIRE release at 10% for anyone interested! And seriously, who wouldn't be?! Today's card might not seem super cool from the photo because it is hard to tell that the card actually cuts off at the flowers, so check out my video on how to create this and you will see how cool it is when it opens! I love this Olesya Bloom stamp and wish I would gave been able to order it when I placed my order a couple days ago. Thanks for showing how to make that border, I am definitely going to try it! Love the edge on that! I appreciate the way you show your coloring it gives me hope that I might be able to do it (with lots of practice). I really like the floral one you used for your card! I love the interest this design creates with th flower border trimmed off. Very pretty! This flower stamp has to be my favorite. Very pretty! I love the cut edge of the card, it looks great. I like the flower you used a lot! I think that may be my favorite of the new release. Loving the flower ! Can never have enough of them! Love this-- might try it this week (with whatever I can find for stamps on hand). Thanks for sharing!! This is a lovely card. I love yhe colors you used! My favorite piece is definitely the flower. That looks so easy. You actually do a great job with the coloring. Stop saying your not good at it, it's art! There are no rules in art. Pretty card. I like the cut out edge. Gorgeous card. I love cutting my edges like that. I did it with butterflies and it turned out so pretty. What a fun card. That cut out edge is very cool! I like to edge too. It adds so much to the card. When sending a Thinking of You, the bright colors will help whoever gets it feel better I am sure. Lovely card...I love the white peacock but the florals and birds are beautifully designed. A stunning card Justine. I actually like the Olesya Bloom stamp you used here today, its just gorgeous! I love the Olesya Bloom and sentiments from this new release. Thanks for the video, Justine! Beautiful card! Love the flower border you created! The Olesya Side Bloom is my favorite new design! Beautiful card, I love all the colors. I just purchased the flower and sentiment!! I love how pretty your cards are! The Nuvo drops take it to a new level. Love the Olesya flower and sentiment. Love the colors used to create this card. I also like the fact that you only used 2 stamps to make this beautiful card. Love the cut edge and the colors you used on the card! Thanks for sharing! My favourite stamp from the new release is the 'Love you' sentiment, I really like the simplicity of it and the 2 fonts used. I also think the 2 Olesya Bloom stamps are amazing! 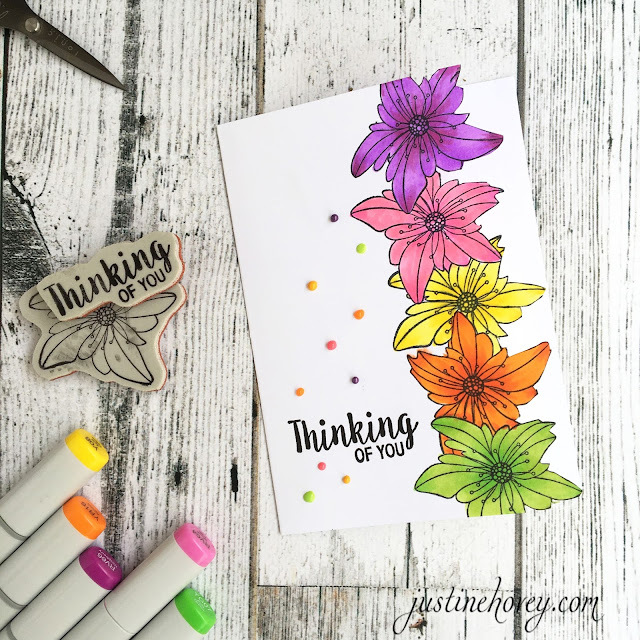 The card you created is gorgeous, the colours are so beautiful and I love the cut out edge! I think the Novo drops are the perfect finishing touch. Thank you for another awesome video! Beautiful card! My favorite stamp from the new release? The Olesya Bloom is probably 1st place, but the Button Flowers are right up there for me, too! Thanks for sharing! Such a pretty card. Like the cut edge and the colors you used. I love so many stamps in the new release, but my fave is the Olesya Bloom Stamp. It's so pretty! I really like the button flower stamp! Very pretty stamping Justine ! I love this technique. You give me hope for my novice coloring technique! Love your colorful card! Thw flowers are my favorite from the new release! Beautiful and colorful card, love the cut edge detail. My favorite from this release is the Button Flower. really pretty way to create interest on a card. thank you for sharing this great technique. My favorite is the Olesya bloom stamp. Beautiful, colorful, and cheerful card. Oh let's see, what's in my cart...LOL Olesya's Bloom, the new peacocks, and all the little sentiments! I like the flower stamps and the swans. Wow! Adorable bright colors! Another lovely card Justine!!! My favourite stamp from the new release is Button Flower Left (and Rgiht too!). Hey Justine, I probably sound like a broken record but again I am totally in LOVE with this card!!! I LOVE all the colors you used and how you cut the edge of the flowers to create such a beautiful edge!Thanks for sharing! The unique edge of the card is fun. Your card is so nice Justine!!! Gorgeous card! I love the fussy cut edge & those awesome flowers! Olesya Blooms is a wonderful set. so pretty! love that cool edge! I love this card and I can think of some stamps I can use. Thank you for the idea. I love Listening to you and watching your videos every morning as I put my makeup on. Love your card. I am going to be trying to CASE this card. Very classy looking. Any flower is my favorite. This is gorgeous! So many Flower stamps, so little time. Justine, The flowers is one of my favorite cards. Thanks for sharing. Such a colorful and happy card! Love the edge. I really like the Olesya Side Bloom and I love your card but I can't fussy cut, I'm terrible at it. My favorite is the Button Flower Left. Olesya Side Bloom is my favorite. Cutting out border of the flowers is such a beautiful look!! Beautiful card! I really liked the Button Flower Left, so lovely! Beautiful flowers! The Nuvo drops are the perfect addition. Hi Justine, Love the edge of the card with those bright flower cut out, very pretty, TFS, Cheers Anna. Lovely card! I really like that flower stamp and the way you made the cut edge on your card. Thanks for the technique video! what a beautiful card. I have these 2 stamps on order - will have to try this cut out! Thank you. I love the peacock! So pretty. I love this Olesya bloom stamp and I love your card, just beautiful! The flowers are gorgeous. I love your card. I love this card, so maybe I should say the Olesya Bloom is my favorite, but I really like the other flowers, too, especially the Side Bloom. Such a lovely card! I really like all the stamps in the April release...especially the two birds facing each other, and the sort of floating flowers. Wow! This is a new company for me. So excited to check them out. Thanks for sharing. I love the Olesya Bloom stamp that you used for the beautiful card in your video. I really want to try doing something like this. Thanks for the inspiration. I love this technique! I'm going to give it a go. So fresh ! Love your card and this new stamp from So Suzy Stamp ! I have to see the new release ! Beautiful card with the detail edge!! I'm new to So Suzy Stamps (just heard about them for the first time yesterday) so I had a lot of looking to do at their shop. As for they new release, I like the button flower stamp set. Love the card you created! Thank you for inspiring us! I love the Swan Outline stamp and also the stamp you used the Olesya Bloom. I am in love with all the text stamps, adorable font! Your card is beautiful! Thanks for sharing. Love this card..so bright and springy! I need to so more masking. Cute card! I like the Open Leaves stamp from the new release. Really different shape and you could use it to frame any floral stamp. From the April release I like the White Peacock stamp. What a bright and lovely flower border! My favs are the Olesya Side Bloom amd the Love Birds! Lovely card...going to check out those stamps. Beautiful card. I love the flowers. My favorite stamp in the new release would be the Love Birds. I like almost all things floral. Your card is gorgeous. I LOVE how bright and colorful this card is! Pretty card. Love this stamp! Oh my. love all the colors and the cutout makes such a nice edge. Oh I love the button flowers in the new release! I have to say WOW about your card. It doesn't translate well in a flat image (hard to see the cut), but it really comes to life on the video! Love my copcs and the colors you used are beatutiful together! So cute! You just make that masking look so easy! I love the colors and its a great transition from falling in love with your black and white creation earlier! LOVE the spring/summer feel! Smart choice of colours with masking technique...lovely!! The Love Birds stamp is my favorite from the April release. Love the colors - also love the Nuvo drops colors to match the flowers! Thank you for sharing!